FeastHome – There is no doubt that the beach life is adored by many people courtesy of the unforgettable experiences it provides. However, not everyone gets the opportunity to enjoy the experiences of living at the coast. Fortunately, you can enjoy this experience by simply adopting a beach style deco for your kitchen. A beach themed deco will go a long way in raising the standards of your kitchen which will positively affect your lifestyle. 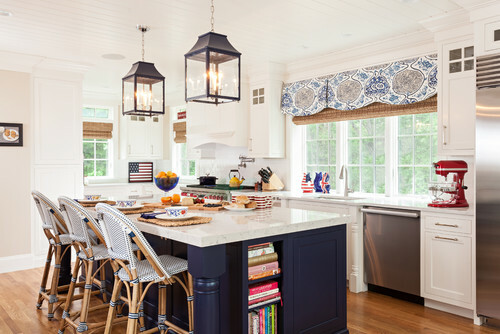 Obtaining a beach styled kitchen does not require you to break the bank since you only need to wear your creative hat and use simple mechanisms to achieve this. You now must be wondering how possible it is to bring a beach-like experience into your home. Aren’t you? Well, here are elements that will help you bring the coastal life into your kitchen. There are numerous ideas which can enable any home owner to enjoy the much-anticipated coastal experience without setting foot on a beach. 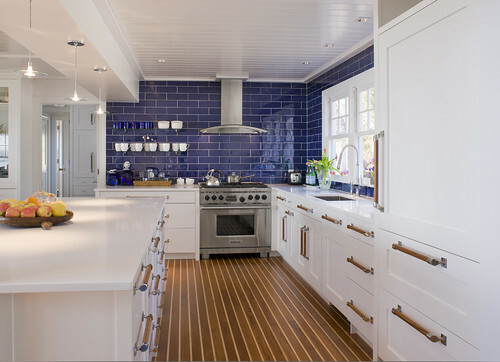 To guide you through the process of giving your kitchen a beach deco, here are ideas that you should consider adopting. The stripped chairs that are mostly used for relaxing at the beach are undoubtedly a great accessory for your kitchen. These chairs are conspicuous and they will have a huge effect on the entire image of the kitchen. These stools comprise of a stripped fabric whose colours will lighten up the kitchen. These fabrics are available in different colours thus you are assured of finding your preferred colour. Nevertheless, since the kitchen attracts high traffic levels and you do not want your fabrics stained, you should consider using stain-resistant fabrics which are easy to clean. Glittering tiles provide an amazing experience as they depict the image of the sun shining on the clear water in the ocean with shells beneath the water. These tiles are available in different sizes and colours and you are assured of achieving this appealing effect despite the type of tiles you settle for. More to that, you do not have to install the tiles on a large area. Depending on your budget, you can install the tiles on a small area and still gain exceptional results. You can never go wrong with a well-done painting job. The kitchen floor might seem insignificant but in reality, it can largely contribute towards a complete makeover in your kitchen. 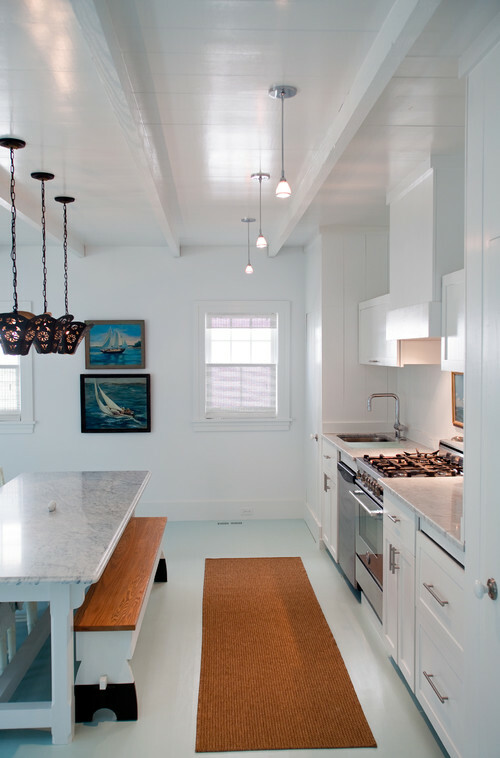 Painting plays a crucial role of reviving old floors and at the same time providing a beach house image. When choosing paint to apply on the kitchen floor, ensure that you settle for nothing but the best quality to minimize the chances of the floor wearing out quickly. The best paint to use is arguably marine paint which is also used on the decks of boats. This paint has the ability to withstand salty water thus it can withstand oil spills. Apart from painting the floors, you may also design your kitchen floor to look like that of a yatch. This unique idea coupled with great colors will ignite a feeling of cruising in the deep sea. Your kitchen’s island is an important and very noticeable installation. Kitchen islands require the best paint job to ensure they supplement other decorations in the kitchen. A beach themed deco will mostly adopt white colors and this is the main colour that will be applied on the worktop. However, you should consider introducing a mix of colours to give the kitchen island an exclusive outlook. To enjoy the best results, you can apply white on the top of the kitchen island. On the bottom side, apply navy blue colour. This colour combination portrays the perfect beach scenario with white symbolizing the white sands whereas the navy blue colour exemplifies the sky. The beach is home to a wide range of colours and that should also be incorporated in your beach themed kitchen. When choosing installations, it is important that you acquire different types of colours as they will inspire a maritime experience. Among the items that can support the nautical experience are furniture. When purchasing furniture, ensure that you pick those with bright colours are they will make the room livelier just like at the beach. On the other hand, if you find plain furniture, that would be better as they will provide an opportunity for you to paint them thus you can use a colour combination that best suits the marine experience you are looking for. 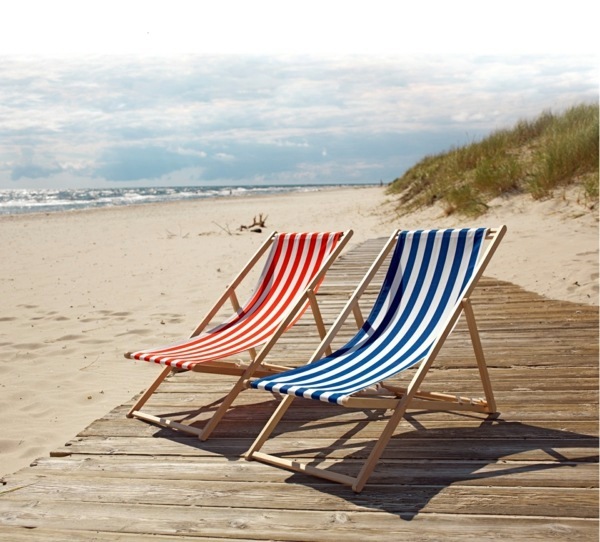 Enjoying the beach experience every day is something that is easily achievable. Additionally, beach themed deco will ensure that your kitchen stands out and at the same time enhance your home ownership experience. Beach themed kitchen deco can be customized according to one’s imagination or previous beach experience. Therefore, now that you have an opportunity to enjoy a beach like experience in your kitchen, do not let this golden opportunity slip through your fingers!